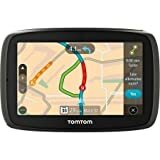 Now buying TomTom GO 50S is easy. Make the Smartest driving decisions by knowing precisely what is going on around you and what lies ahead. Experience a new world of navigation with the go 50 S (Certified Refurbished).